Fertile, well drained soil with compost dug in. In clay soil, use raised beds or rows. Beet, Chamomile, Carrot, Strawberry, Lettuce, Chinese Cabbage and Cabbage. Set individual cloves in prepared ground in the fall. They will root during the winter, and multiply into a cluster in late spring or early summer. Alternatively, plant first thing in spring, or grow from seed and set out seedlings in early spring. Used in place of onions for concentrated flavor. Harvest in early summer when the tops begin to fail, and the bulbs have divided into several plump bulblets. 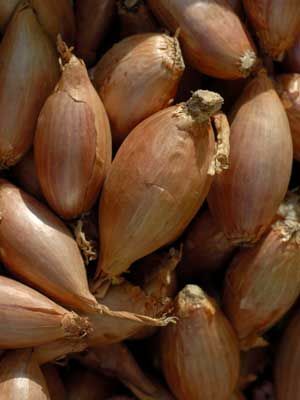 If storing shallots, cure in a dry place for 10 days after pulling the plants. Onion root maggots can cause plants to collapse. Remove infested plants.